With only a couple of banners to attach, these daemonsmith-sorcerers are my latest additions to my chaos dwarfs. 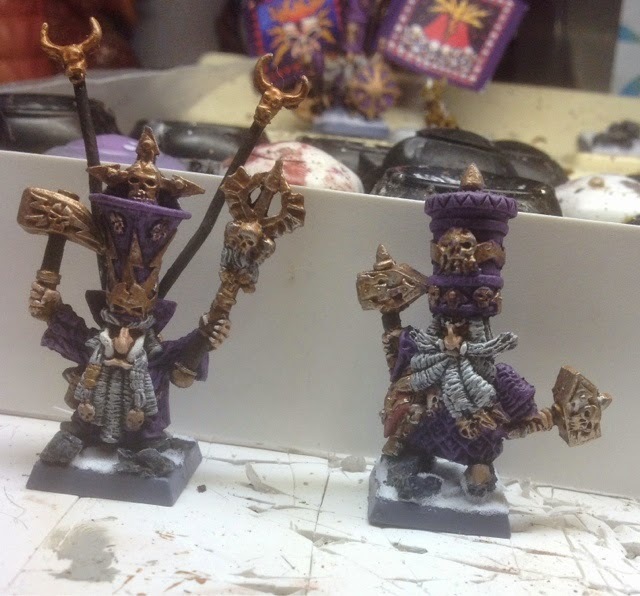 The one of the left is the classic GW big hat sorcerer who is actually on his second paint job after I was not happy with his first and stripped him using simple green. He will have some of the classic chaos dwarf banners attached and then will be ready to rock and roll. The second sorcerer is one of the infamous zonkcast range. I have spoken about these before so the less said the better. I converted a banner pole but was not happy with it so he will go without and fulfill either a level 1 or 2 sorcerer slot.